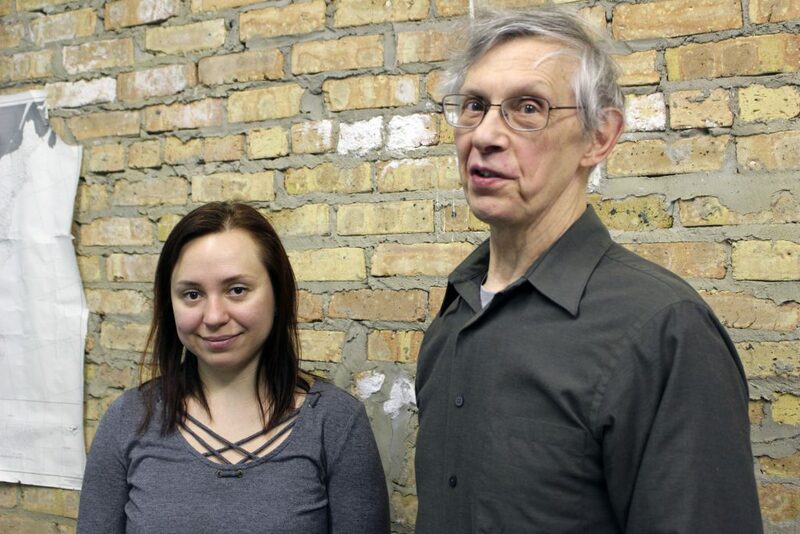 Heartland Human Care Services’ anti-trafficking program, Freedom from Trafficking (FFT), partners with Traffick Free, a faith-motivated organization in Chicago that raises awareness about human trafficking in the Chicagoland area. Anytime FFT has a need, Traffick Free sends a call to action to their volunteer network. That is how Lauren and Kourtney Seaman came to volunteer with FFT. One day, Lauren and Kourtney dropped off donated girls’ clothes that they no longer needed and began a conversation with FFT staff about the program’s work and the needs of survivors – about 75% of whom are undocumented when they begin services. At the time, a barrier many program participants were facing involved accessing culturally appropriate food at the local food pantries. Pantries often also require some form of identification and/or their hours are sporadic, making it difficult for FFT participants to obtain food. Kourtney and Lauren looked at each other and said “We have a storage closet in our building, why don’t we make it a food pantry for your program?” And they did. But their generosity and huge hearts did not stop there. In January 2014, FFT was working with an undocumented female survivor of labor trafficking from Africa named Mariam. She was staying at a shelter but her allowable time to stay there was ending and she needed somewhere safe to go. After many phone calls to programs across the city, FFT staff sent a desperate email to Traffick Free explaining Mariam’s situation. By that evening, Kourtney had called and offered to let Mariam stay in their spare bedroom. But they could only house Mariam for up to two weeks because Kourtney’s mom was coming to stay with them. Kourtney was pregnant with their second daughter and due in just a few weeks. When Mariam first arrived, she would stay in her room much of the time but slowly, she began to have meals with Lauren and Kourtney’s family. She then began to cook meals with them from her home country. She spent more of her time in their living room than in her room. She was there when their second daughter was born. Lauren and Kourtney adjusted their home and welcomed both Kourtney’s mom and Mariam to stay. FFT staff worked hard to identify a transitional housing program that had an opening and could take Mariam, but when they did, they found out there was a catch. She had to be considered “homeless” in order to get housing, meaning that Mariam had to move out of Lauren and Kourtney’s safe and comfortable home and into a homeless shelter in order to qualify for the program. Once back in the shelter, it took months for the transitional housing program to find Mariam an apartment due to landlords not accepting her without credit and without a social security number. During the time she was waiting for her studio apartment, Mariam spent nearly every day at Lauren and Kourtney’s home because she felt safe and supported there. Lauren and Kourtney along with their church group, Reach77, remain in Mariam’s life today. She visits them weekly for meals and for their Bible study group. She joins them for holidays. She visited when their third daughter was born. And, with the help of Reach77, Mariam moved into a new apartment with her permanent Housing Choice Voucher through the Chicago Housing Authority — a program that launched in April of 2017 after much advocacy by anti-trafficking programs, the Administration of Children and Families, CHA, and HUD. It was stories like Mariam’s that helped Freedom from Trafficking convince leaders that something had to change within the housing system to ensure survivors like Mariam did not have to be re-traumatized over and over again in order to find a safe place to lay their head at night. Lauren, Kourtney, and Reach77 have been invaluable allies and partners in this work. They constantly ask “what do you need,” and then quickly respond with “okay, we are on it.” The Freedom from Trafficking program would not be able to carry out the critical services that we provided to survivors without the support and generosity of this group and volunteers like Lauren and Kourtney. Christian remembers the exact moment he decided to join the military. On September 11, 2001 he was just 8 years old but his memories of the events that unfolded remain vivid. He remembers going to school, watching the news with his peers and teachers – but most importantly, he remembers the inherent pull towards protecting his country, towards service. Nine years later, Christian joined the Army at the age of 17. During the testing process, he was given a rather large selection but ultimately decided to be a medic. While he was ready to join infantry, his family’s protective nature and concern led him to find a compromise that would still keep him close to the front lines. With tours in Afghanistan and Africa, Christian spent four years in active duty and a quarter of his life in service. When it was time to transition to the next chapter of his life – coming home – he felt both excited and scared. He was ready to take advantage of the GI Bill and find the skills necessary to help people in civilian life, but the instant transition of responsibilities felt daunting. As he settled into life back home, Christian stayed with family but that was short-lived – and after tensions rose to uncomfortable levels, Christian decided to find a path all his own. But Christian was determined and he kept moving forward. He enrolled in one of Chicago’s City Colleges and continued to apply for local work. During one fateful visit at the Chicago Veterans Affairs office, Christian finally began to find a leg up. 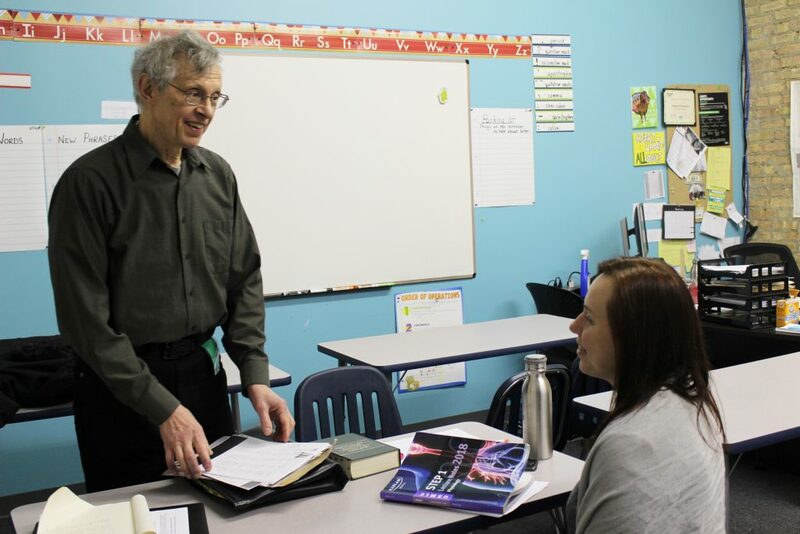 A checkup and routine immunizations for school gave him the opportunity to speak with a local case manager, who mentioned Heartland Alliance’s Supportive Services for Veterans and their Families (SSVF) program. He made the call and met with our team just a few days later. SSVF case managers were able to get Christian off the streets, helping him find an apartment, providing nine-months of rental assistance, and supporting him every step of the way as he worked to build a brighter future. He used his military-medic skills to become an EMT with a local ambulance company and got a part-time job as a lifeguard. The income from his new jobs, combined with the rental assistance, meant he was able to save and make plans for the future. He paid off credit cards and began building a nest egg while going back to school. Christian is truly a model participant. His dedication and mission-driven attitude underscores the SSVF program’s very purpose. We believe that everyone should have access to housing, healthcare, jobs, and justice. We believe that because we know how people respond to that opportunity. Ultimately, it was Christian’s incredible response that led SSVF case managers to invite him to apply for a new peer-support specialist position within the program – which he ultimately secured! Now Christian spends his Tuesdays and Wednesdays working hand in hand with those who are experiencing the same struggles he’s worked so hard to overcome. And, Christian’s dedication to his peers has already made a huge impact on the program’s successes. Service members who have struggled to find employment or housing now have a deeper connection with the program, and feel as though their goals are attainable thanks to Christian’s compassion, knowledge, and experience. “It’s so important to have someone who can relate to the people we serve, making that bond between participants and program more cohesive. A lot of people open up to me because I’m a veteran, because I was in the program. A lot of times people have spilled their guts to me, and people need that. Sometimes, we lock down as veterans unless we are talking to other veterans.” Today, he continues to serve his country and work toward his degree in psychology, which he’ll complete in June. Ali Brown started as a housing resource specialist for the Supportive Services for Veteran Families (SSVF) team, dedicated to the idea of serving vulnerable populations. Her passion for the work has allowed her to thrive at SSVF where she is now a program manager. Helping veterans find housing and opportunity in Chicago is more than just a job for Ali, it’s a personal mission. I got an undergraduate degree in clinical psychology. I’ve always been passionate about homeless services – and actually got my start at Heartland Alliance Health right out of grad school. I was working with individuals who were chronically homeless, and just loved the feeling of the huge impact I was making on the lives of my participants. 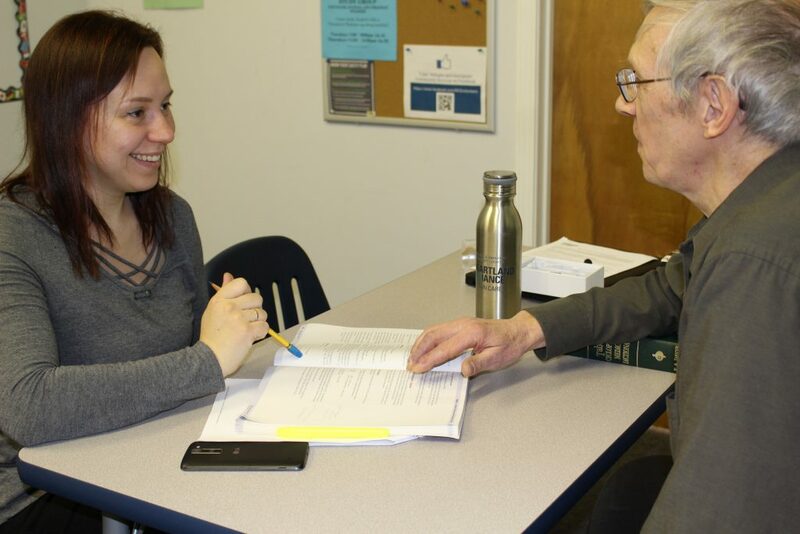 That particular program was ending, and I knew I wanted to continue to serve individuals experiencing homelessness – and continue working for Heartland Alliance. Fortunately for me, I found SSVF. With veterans services specifically, there’s been a huge national push to end veteran homelessness. Having a chance to be a part of that in one of the largest cities in the country has been profound. Since 2014, we’ve seen the amount of veterans living on the streets of Chicago go from over 3,000 to under 700. That’s spectacular. These are individuals who have sacrificed for us, so of course we should make sure they can live under a roof. I’ve felt that right off the bat at Heartland Alliance. When you start to see the changes in the lives of the people we serve, it moves you. Even small successes can transform into huge life changing events. Heartland Alliance’s mission aligns with who I want to be and what I want to do. It really is all about the successes of our participants. We’ve had some participants come in a bit jaded – people who had bad experiences with other service agencies, and we’ve shifted their perspective. Seeing the hope come back into their lives, it’s so fulfilling. It really is about educating yourself to be a more helpful person. We have a coordinated entry system in Chicago that actually helps people get connected to the right program now, so knowing what is near your home or near your place of work can be a dramatic first step to helping someone exit homelessness. At Heartland Alliance, we believe in a holistic approach to ending poverty – one that requires access to quality housing, healthcare, jobs, and justice. From the locally grown produce distributed across Chicago at our local food pantries, to the job training and placement programming – our Chicago FarmWorks Urban Farm in East Garfield Park embodies that holistic approach while also bringing communities together. It’s been a busy summer at the farm. 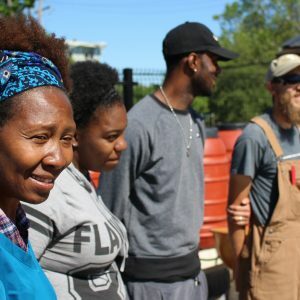 Leaders from corporate and civic life have come together to make the FarmWorks program a hotbed of volunteerism, community activism, and revitalization. 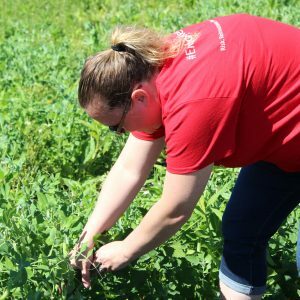 As a result, over 500 people have visited the 2-acre farm to help with everything from weeding and plot planning, to planting and tending the crops, and even preparation for harvest time and fall food-pantry logistics. This work simply couldn’t be done without the tremendous help of our individual, corporate, group, and nonprofit partners. 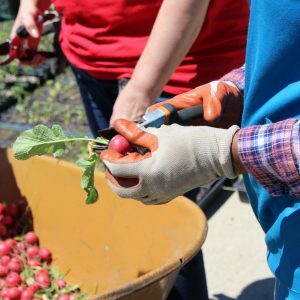 Conagra Brands has generously invested financial resources to help ensure the farm is working at its best capacity to increase access to the healthy, local food that individuals and families need to reach their full potential. With Conagra’s support, FarmWorks has been able to create a drip irrigation system to improve yields; build a greenhouse and other structures to start more seedlings on-site and extend the growing season; and implement a more reliable and robust vegetable transport plan for our partner pantries. Thanks to Conagra, we’ve been able to increase our yield and distribution of additional servings of vegetables for communities experiencing food insecurity. This year alone we will grow and distribute 40,000 servings of food, impacting more than 1,400 Chicagoans. It takes a village to create such an impact, and we also couldn’t do this work without other partners like the City of Chicago, the Chicago Community Trust, and Chicago Tribune Charities/McCormick Foundation, as well as hundreds of volunteers from companies like BCG, Aon, Exelon, & Northern Trust. All have contributed hours of labor on the farm itself and invested resources to ensure the continued success of the program. And most importantly, we couldn’t make these incredible impacts without the support, input, and hard work of the very people we serve. Heartland Alliance participants work the soil of the farm throughout the year, gaining valuable employment experience and education. We work one-on-one with the community in the constant effort to build a more-impactful program and to provide produce that the community most wants to eat. Tomatoes, hot peppers, spinach, lettuce, radishes, mustard greens, collard greens, green beans, onions, potatoes, okra, cucumbers, summer squash – we grow over 20 different types of produce, all recommended by the community itself. As a result, nearly 80% of our participants reported satisfaction with the quality and variety of the produce they received at our Vital Bridges food pantries. And you, too, can help make an impact! 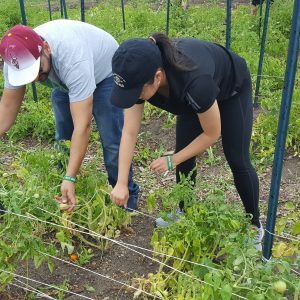 Throughout the year, the Chicago FarmWorks program has monthly volunteer days where anyone can join in the fun and get their hands dirty. Check out the Heartland Alliance Facebook Page for upcoming events or learn more about FarmWorks here. 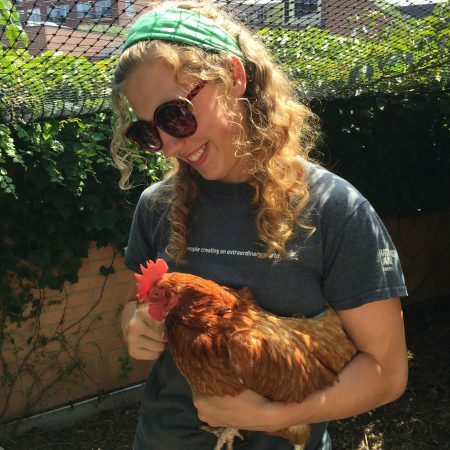 With a green thumb and a passion for community building, Jessica Surma creates impact through farming as the manager of our Chicago FarmWorks urban farm. For Jessica, success is all about growth – and she finds it in all aspects of the job. I always knew that I needed to have a job that gave me the opportunity to work outside. Before running FarmWorks, I spent a lot of time working in environmental education and policy. It was great, impactful work, but I my passion was to have a direct impact on my local communities. 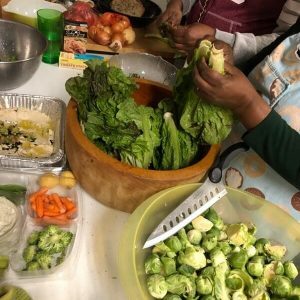 I grew up around here, and when I learned about urban agriculture – and the impact it has on providing job opportunities, food security, and community engagement opportunities, it was a no-brainer. 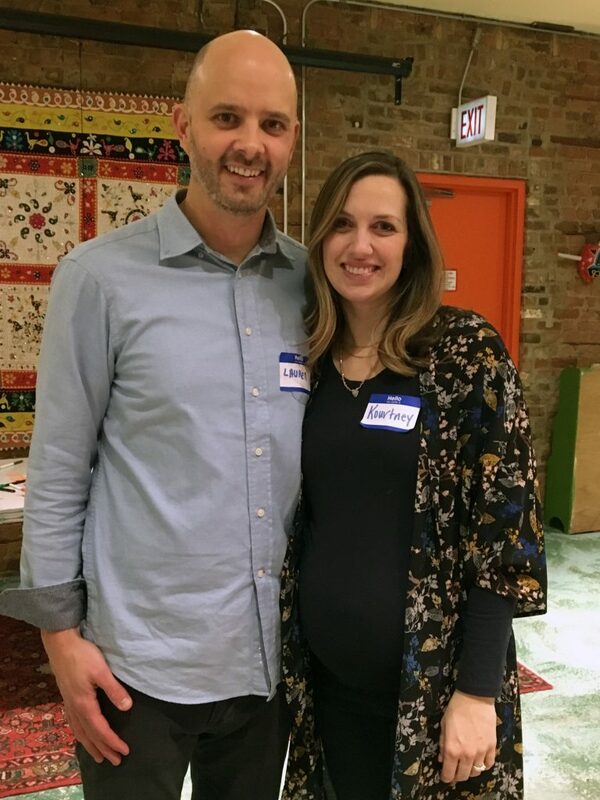 I started volunteering at a lot of local farms and gardens and working a lot in food-security – and eventually I jumped at the opportunity to help run 2 acres of urban farmland when Chicago FarmWorks popped up. I find it is really important to use the space a community already has – whether it be a vacant lot or abandoned building – and transform it and turn it into something positive. FarmWorks serves as an outlet for jobs, food, and a community coming together. That gives people something to be proud of in the neighborhood. East Garfield Park can get a lot of bad press, and this shows that there is more to this incredible neighborhood than what the papers write about. Similarly, green space gives people the chance to heal, grow, and thrive. It’s incredible seeing people who were down or unwell spend a few hours a day at the farm, and we watch them change dramatically. On another note, many pantries don’t have a lot of healthy food options. This program was able to provide over 37,000 servings of fresh produce to our Heartland Alliance Vital bridges food pantries across the city. I spent years looking for the job that I wanted – and finding a place that will pay you for your passion is a special thing. I knew pretty early in the job that I was in the right place. We were doing our first honey harvest (we have a few bee colonies), and we had so many folks from the community excited to receive that honey and see the results of our care and work – it was really special. I love seeing the transformations in people that come to our program – both in their interest in the farm and in their confidence to work. It’s invigorating to see people get excited about growing food and enjoying the life on the farm, as well as finding the confidence to speak with supervisors and employers. It sort of happens all at once, and it really is fulfilling. We’re always looking for volunteers! We’ve got monthly volunteer days. We’re also happy to have corporate, church, or school groups come out. Click here to volunteer. Learn more about FarmWorks here.